Sport Island Freedom is at times impressively ambitious, but mostly disappointingly vague. Ten events chart the game's scattershot approach to the Kinect controls. Although it's mainly young players who are best served, there is a glimmer of brilliance in the Kinect controlled first person shooter Paint Ball activity. 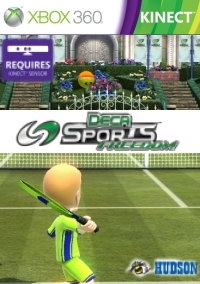 Sport Island Freedom brings the growing success of Sports Island (Decca Sports elsewhere) to the 360 via the Kinect controller. It's an impressive looking package that ambitiously offers Tennis, Boxing, Archery, Beach Volleyball, Paint Ball, Dodge Ball, Kendo, Mogul Skiing, Snowboard Cross and Figure Skating. Each activity has its own control Kinect scheme that is just as ambitious as the breadth of sports covered. These are something of a mixed bag, while some try and extract every ounce of fluid movement from Kinect others simply use gestures to trigger actions. Which you prefer of these depends on what sort of game experience you are after. We found our kids really enjoyed the Volleyball, Boxing and Figure Skating as these were the simplest to control. All you do is jump, crouch or raise your arms at the right time to trigger the related event. But I found that it was the more ambitious activities that I enjoyed. Paint Ball in particular was a fascinating, if a little mind-stretching. This is essentially a Kinect controlled first person shooting game. This is essentially a Kinect controlled first person shooting game. Movement is determined from the position of your feet on the floor. Move forwards and you advance, move back and you retreat - as well as strafing left and right. 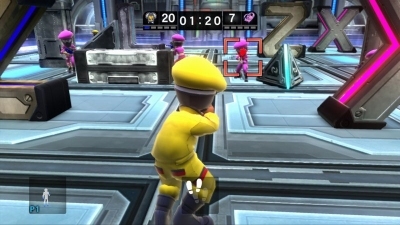 Holding you arm straight out at the screen then let you turn and look around as well as target, in a similar fashion to how the Wii-mote is used. Finally you can duck down by crouching and fir by flicking your arm at the screen. The first time I tried this reminded me of switching from mouse to game pad. It initially seemed totally unusable as my brain struggled to translate the required movement into the right bodily input. After a bit of time though, this started to click and the novelty of controlling a first person shooter with just Kinect's movement sensor was actually quite exciting - if a little fiddly. 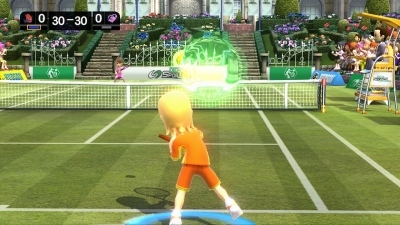 Tennis may not have been as ambitious as Paint Ball, but I was impressed that it tried to create one-to-one game play - mirroring my movements via the on-screen player. 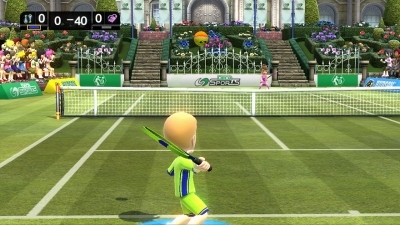 This looked very much like a high resolution Wii-Sports, although when you come to hit the ball it lacked a sense of connection. Because of this, it was hard to trigger the shot at the right time. It also meant that without a controller to hold there was no way to apply any spin to the ball - which is one of my favourite aspects of tennis. This is so nearly perfect that it ends up being rather frustrating - and reflects the general tone of Sports Island Freedom. Modul Skiing, Snowboard Cross and Archery are a set of activities that offer controls somewhere between the action triggers of Volley Ball and complexity of Paint Ball. 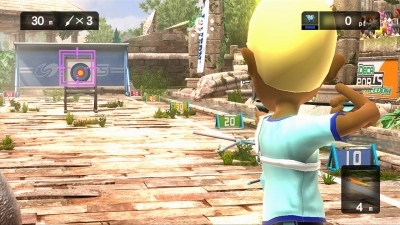 Archery is an interesting touch stone - being offered both by Wii-Sports Resort and PS3 Move's Sports Champions. 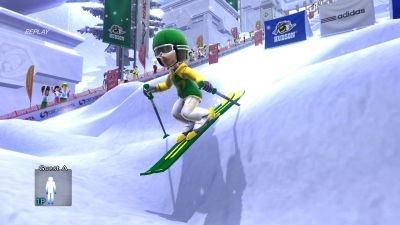 In Sports Island Freedom you use the same gesture as you do on the other platforms, and aim the shot with the arm holding the bow. To release the arrow you drop your string arm. It was an action that felt natural and work well to aim, but when it came to fire I sometime struggled to get Kinect to recognise my gesture. This is so nearly perfect that it ends up being rather frustrating - and reflects the general tone of Sports Island Freedom. Many of the events are close to being a lot of fun, without quite getting things spot on. Where it shines brightest is at either end of the control spectrum. Where it shines brightest is at either end of the control spectrum. 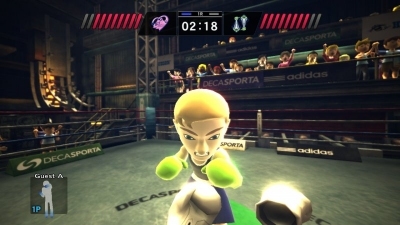 The very simple trigger based games like Volleyball, Boxing and Figure Skating are simple to use and great for young gamers. The most ambitious events like Paint Ball really stretch what is possible with Kinect in an intelligent way. However, because the majority of the events fall between these two extremes the package as a whole is hard to recommend. Having played all this I hold our much more hope for Sports Island 3 Wii that is the first game in the series to use the MotionPlus add-on. 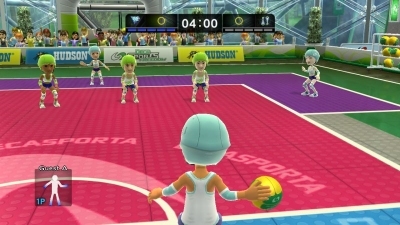 Sports Island Freedom seems to prove that the Wii is still best place to deliver these sorts of sporting minigames.